One dress, 16 possibilities. This short chiffon dress in orange can be worn in a multitude of ways— Strapless, Backless, Off the Shoulder, Cap Sleeves and more! This will equally work for black tie parties as well as summer garden soirees. Also perfect for dressing bridesmaids who can come in different shapes and sizes. Pick a colour and let each pick the style most flattering to their shape. 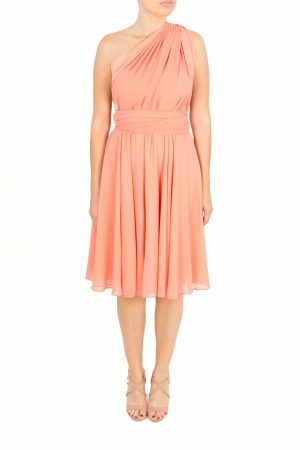 The versatility of this style also means that this is the bridesmaid dress that will get worn again. Choose from a wide range of styles from strapless, backless, grecian, one shoulder and cap sleeves. Take inspiration from our How To Tie Guide. *Limited stock available. If ordering multiple dresses, please allow 4 weeks for your order to be delivered. – Delivery is within 30 days of ordering. – Free Standard Delivery on orders over £80. – Delivery is within 40 days of ordering. – Any duties and taxes that may arise are your responsibility. Items that are unworn, unused and undamaged may be returned. Please notify us within 14 days of receiving the item. You are responsible for returning the items to us. Please ensure that all tags and packaging are intact. All sales of custom orders are final, items are non refundable or exchangeable. Or for more help and advice please email us at customerservice@lavalia.co.uk or you can contact us by phone +442037003906.